So he's now going to pretend he backs a deal which goes completely against what he was calling for. Wouldn't surprise me if Vine got him in a headlock and made him promise her he won't resign. She can't bare the thought of not being invited to all those Westminster do's. Have you got everything, Micheal? Packed lunch? Spare shoelaces? Nasal spray? Handkerchief? Poisoned apple for Theresa? My script for the telly people? Sara and Uncle Rupert have told him to stay. How is he not doing something breaking news? You'd have to ask David Davis. Says Trevor Kavanagh as Gove doesn't have any friends. Or is that just his wife slagging him off over a G&T? The Sun's also putting Gove in the frame for potentially the worst food shortages since WWII. 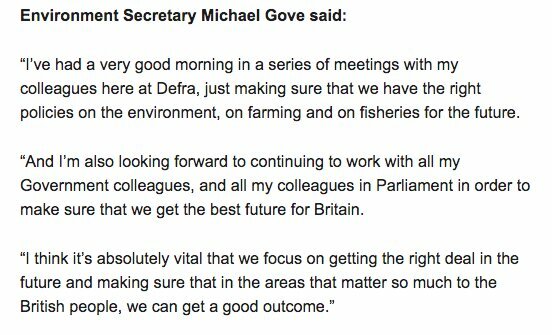 Although Gove has briefed them as to why he backs May's deal to ensure this won't happen. But but but project fear etc. Gove has clearly done the maths and worked out that there is not enough support amongst the parliamentary party to elect a Brexiteer as the next leader so he is hedging his bets by ensuring that when there is a leadership election he can draw support from all wings of the party. He has positioned himself as a pragmatic Brexiteer. Gove made the right moves as the ERG will collapse as a force if parliament takes no deal off the table. I’ve had a gut feeling for a bit that he’s going to make a move for the leadership. I do think he’d be a bit of an electoral liabilit as he looks like either a perv or a ventriloquist’s dummy, can’t see Dagenham Dave being keen.